PageTranslator will allow your Joomla visitors to translate the texts on your Joomla website to almost any language with a single click using the Google Translator service. SiteGround has created this module to help you add a simple but very useful functionality to your Joomla website. After you install and enable it your visitors will be able to read your pages in their preferred language using Google Translate. 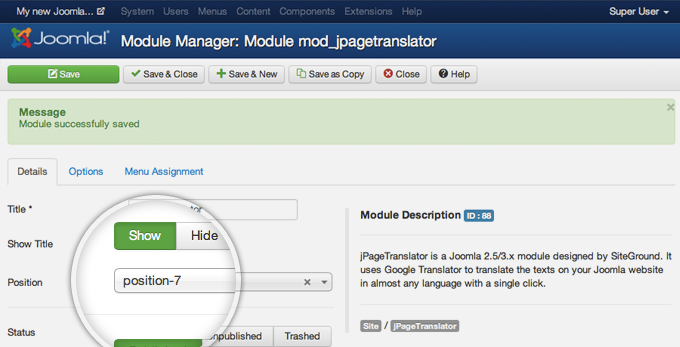 Get jPageTranslator for Joomla version 2.5 or higher now! 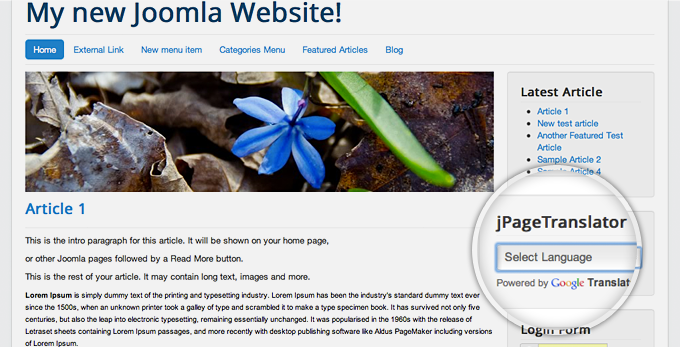 If you are still using Joomla 1.5 you should download jPageTranslator for Joomla 1.5. However, we strongly recommend that you upgrade your Joomla to 2.5 or higher. Jooomla 1.5 is no longer supported and using it is not secure. 2. Upload jPageTranslator to your Joomla. Once you have the module downloaded, you need to login to your Joomla admin panel, go to the Extensions Manager and upload the zipped jPageTranslator package that you have downloaded to your local machine. Uploading jPageTranslator through Joomla extension manager. 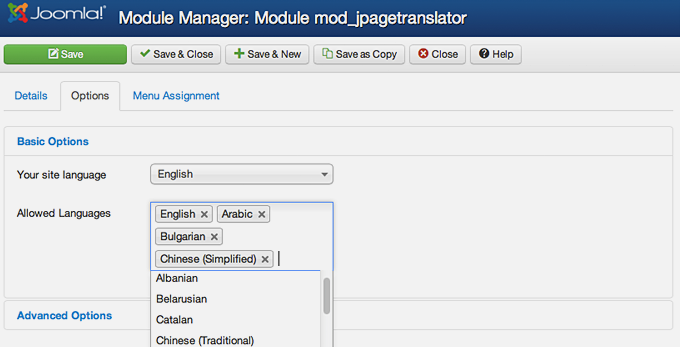 After installing jPageTranslator you will be able to find it listed in the Module Manager. If the module list is too long, use the search option. Once you locate the Plugin in the list click on its name to see the details about jPageTranslator. Locating jPageTranslator using the search function in the Joomla Module Manager. Once you access the jPageTranslator module manager you should choose a position for the share box that is supported by the template you use and change the status of the module to published. 2. Choose pages on which jPageTranslator will be shown. In order to configure jPageTranslator, click on the Options tab in the module page. Here, you will find the different settings you can adjust for jPageTranslator. Your site language - Select the default language of your website. Allowed Languages - Choose the allowed languages you want your visitors to select from.